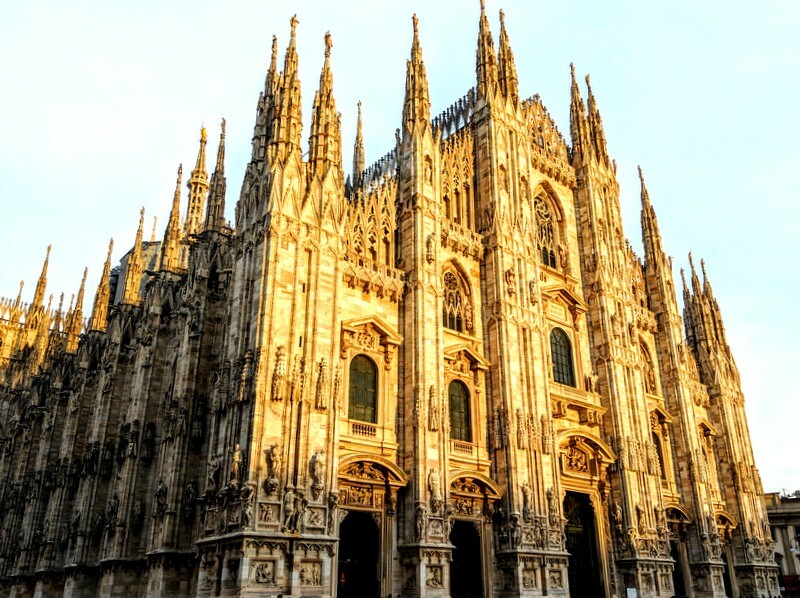 Milano, the European capital of fashion, is certainly the most exciting city in Italy and not only for fashion lovers, but also for people, who love culture, history and food. Here are the best places to visit in Milan on a weekend. Took an Alitalia flight from London City airport to Milano Linate. The flight took about 2 hours. The flight was quick and comfortable. Did you know that Alitalia is now the most punctual airline in the World? The service is very attentive. 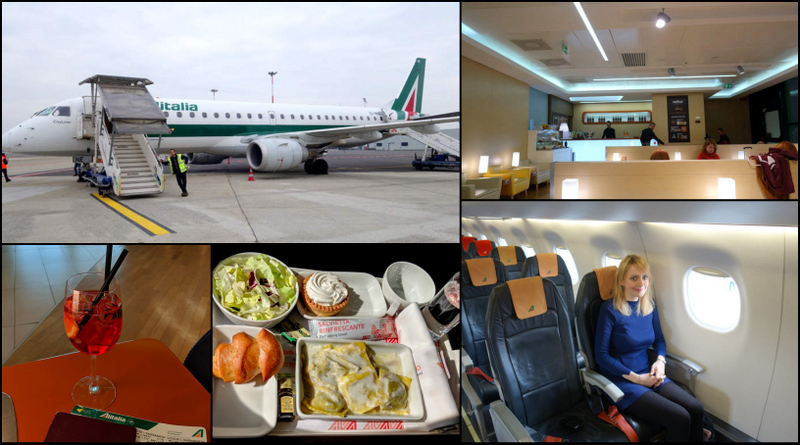 The best thing about flying with Alitalia is that you get to experience Italian hospitality. The flight attendants are paying special attention to make sure you have a nice flight and you have everything you need and to ensure your convenience. My favorite seat is 1A in business class because I have the most legroom. The flight attendants come around with drinks, then a meal that consisted of a small bowl of pasta, salad, and a dessert. They serve a selection of alcohol with it. After the meal, you have the option to choose between limoncello and grappa. Before landing, they hand out delicious chocolate. On my return flight, I got to enjoy the Alitalia flagship Lounge at the Linate airport. It is called Casa Alitalia, because it feels like you are in somebody’s home. I loved hanging out in the lounge sipping Aperol Spritz at 11 am. There is a selection of Italian snacks and wines and prosecco as well. The lounge has a great view of the airport, where you can see the flights taking off. The best thing about flying to Linate is that reaching the city center is quick and easy from the airport. I reached the center in about 20 minutes. Monza is only about half an hour drive from Milan. You can also hop on a train at Centrale or Garibaldi station and you will get to Monza in 10-20 minutes. Monza is a fascinating city to visit, you can see the Duomo (cathedral) that was built in 595. 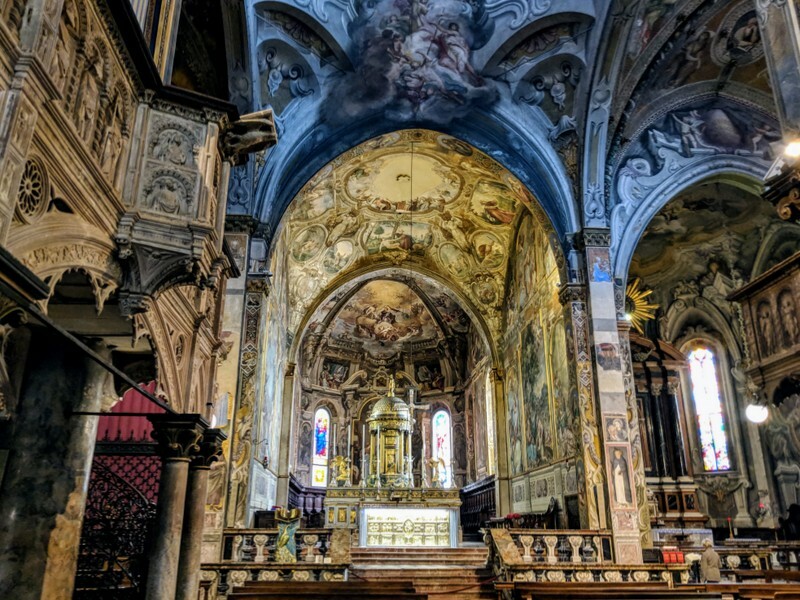 It is currently covered with scaffolding on the outside, so you may not be too impressed by it at first sight, but once you walk inside, you will find a frescoed chapel. There is also a museum attached to the chapel. It is full of religious relics. The most interesting part of the chapel is the Iron Crown of Lombardy, which you can see inside the chapel. It is supposed to contain one of the nails used at the crucifixion of Jesus. After visiting the chapel, we headed over to visit Villa Reale, the royal villa of the Savoy family, which contains over 700 rooms. It was built between 1777 and 1780 by the will of empress Marie-Therese of Austria. Behind the royal villa, you can visit the Parco di Monza, which is the largest enclosed park in Europe. You can see the Autodromo Nazionale (national circuit) inside the park. This is where the Formula 1 Grand Prix takes place every September. It is the oldest Formula 1 race in Europe. You can even take a tour to visit the circuit. The restaurant is one of the most renowned restaurants in Monza and the whole of Lombardy region. The dining room is elegant and the food is delicious. We tasted a beetroot risotto as the first course. colorful and tasty. The second course was pork, wrapped in bacon. We had a small ball filled with apple and cinnamon and a little bit of spinach on the side. The food was great. The last course was a white chocolate mousse. 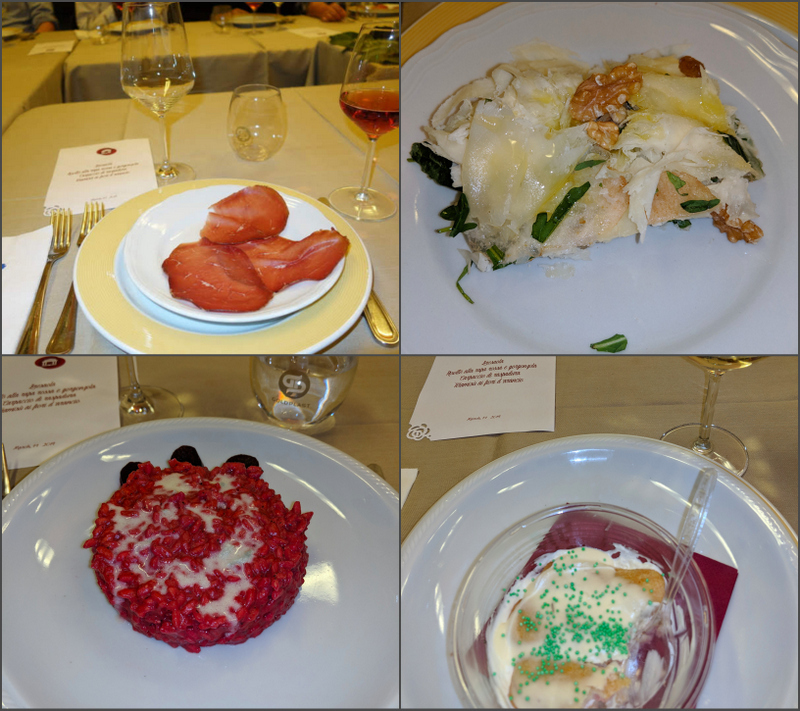 Food never really disappoints in Italy, but this meal was exceptional. The service was very friendly as well. Milan and Paris are certainly the two best shopping cities in Europe. You can find all the luxury shops on Via Montenapoleone in Milano. Make sure to visit the stores of some of the most iconic Italian brands such as the menswear Larusmiani. Visiting some of these shops inside is a great experience. 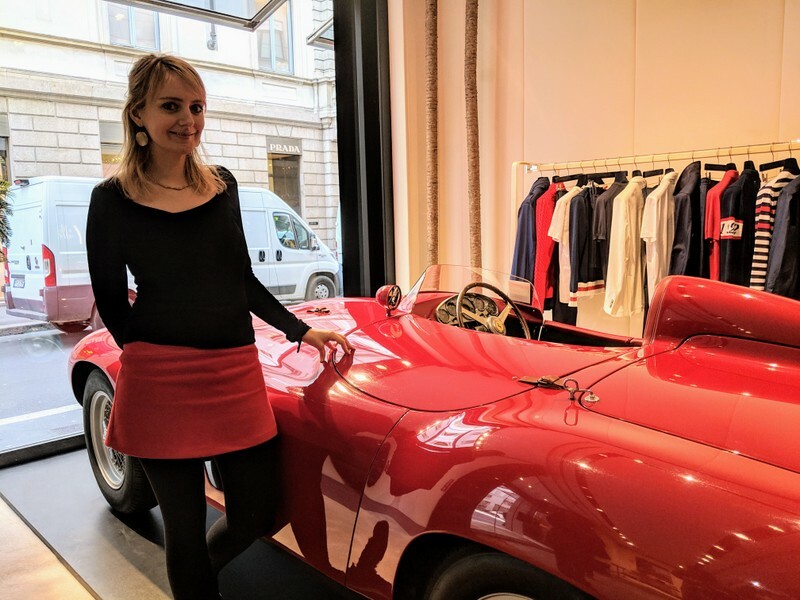 For example, in the Larusmiani shop, they parked a vintage Ferrari that was racing in Monza in 1955. 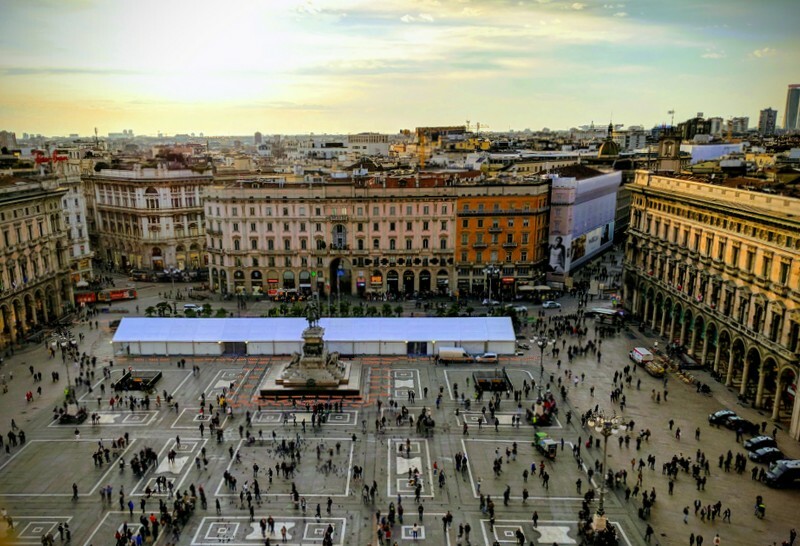 One of the best things to do in Milano is taking a tour on the top of the Duomo (the main cathedral in the center of the city). After taking the elevator to the top, you will see a spectacular view of the city. The Duomo was built from the back. They used marble to build this beautiful cathedral. Marble requires constant cleaning as it turns black after a couple of hundreds of years. It took many decades to complete the Duomo and only when Napoleon rushed to finish it, the cathedral was completed. Napoleon wanted to be crowned as the king of Italy in the Duomo, so he made sure it was finished. The tour on the rooftop was amazing. We could see the entire city from above. On top of the roof, there was a Madonna statue. 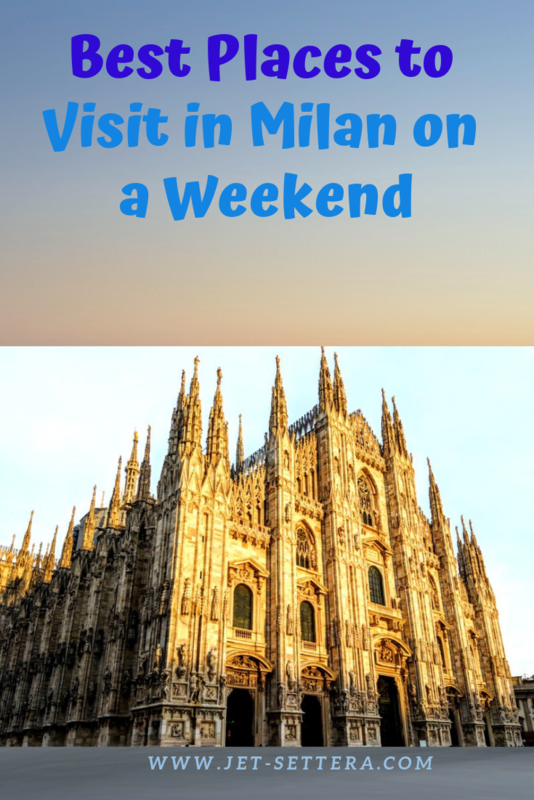 Visiting the top of the Duomo is an absolute must for everyone, who visits Milano. 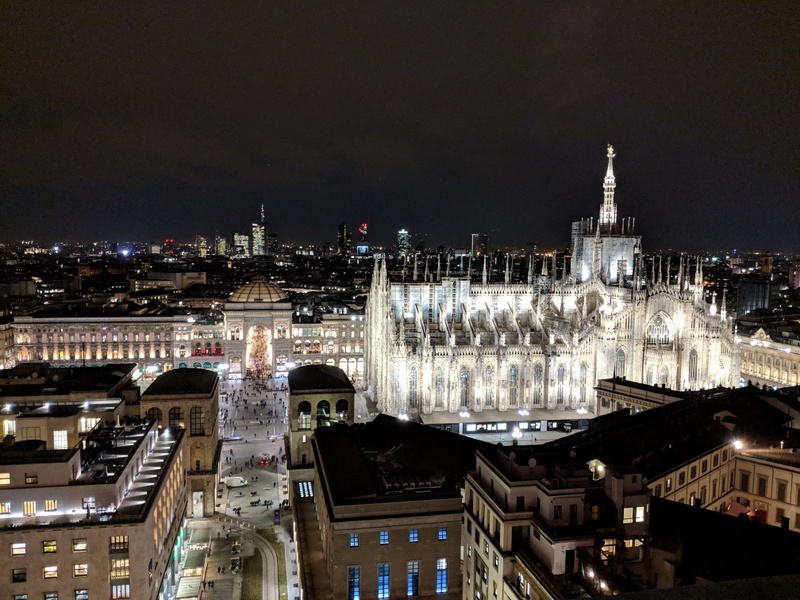 Talking about great views… If you want an even better view of Milano than what you can get from the top of the Duomo, head up to the Martini terrace for a cocktail or two in the evening. You can see the entire city center lit up. It is truly incredible. Enjoy a delicious cocktail on the rooftop and take some incredible pictures for your Instagram account from the top of the city. Porta del Vino is a 200-year-old building on Piazza Cinque Giornata, where visitors can try some of the best wines of the Lombardy region. We had a four-course meal, each course was paired with a different wine. It started with bresaola, which is an Italian ham. The second course was risotto with beetroot and gorgonzola cheese. The third course was a dish made of the famous Italian shredded cheese with nuts and honey. It was my favorite. The third course was a peach tiramisu. The food was home-made and the wines were very tasty. The Scala is one of the most famous places in the World for opera lovers. Here you can listen to some of the most famous opera singers from around the World. The Scala also has a small museum, where you can learn about the history of the building. It was initially built in the 18th century and people would come and watch a performance standing while eating their snacks. They rebuilt the theatre a few times because it was destroyed by fire. It is a once in a lifetime experience to see an opera at the Scala and a must for every music lover. 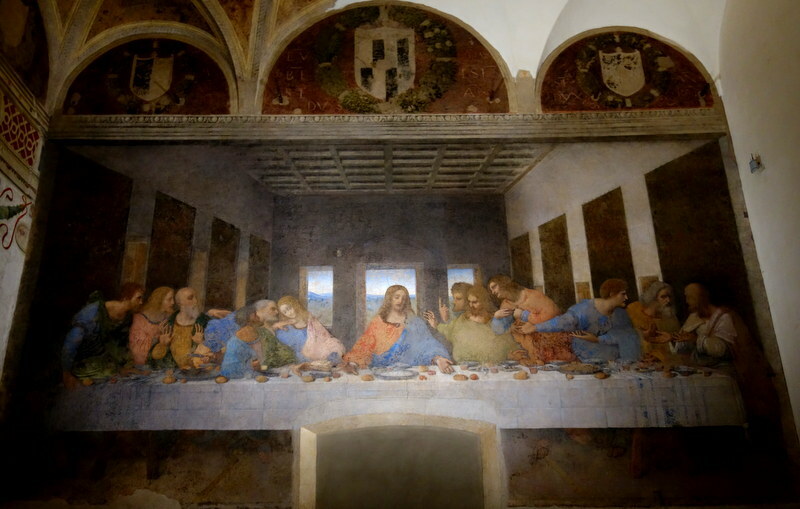 Visit the famous mural by Leonardo da Vinci which was painted in the 15th century at the Santa Maria delle Grazie chapel in Milan. We ran into our tour guide, who was dressed up as Leonardo da Vinci and he was talking about his own life story. He took us inside his house and showed us his beautifully decorated rooms. He told us about the history of the house. The first room was the zodiac room, with all the star signs painted on the ceiling. In the backyard, we visited a beautiful garden, where Leonardo used to grow grapes and make his own wine. Later, when we were having lunch at the cafeteria of the gift shop, we tasted the homemade wine that was made of the grapes of the garden. After visiting the house, we went into the chapel to see the famous mural of Leonardo Da Vinci. It is painted on the wall of a large room. The details of the paintings are fascinating. No wonder why da Vinci worked on this painting for 3 years. The colors have faded out a bit in the last 500 years, but the mural is still beautiful. It’s a must see if you are in Milan. 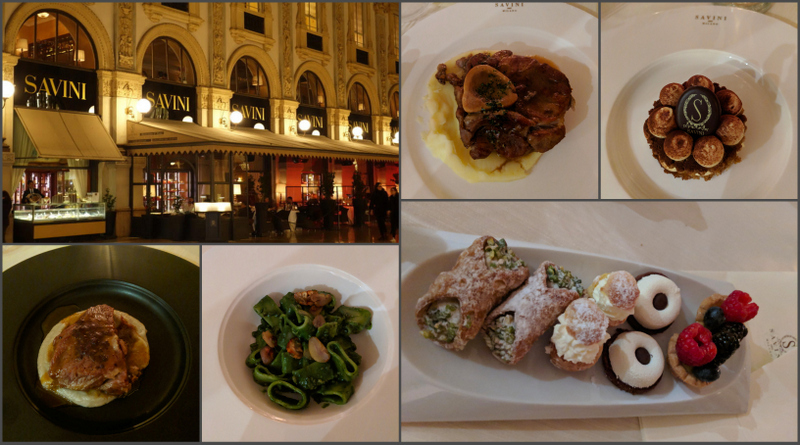 Savini Restaurant was founded in 1867 and it is located in the Galleria Vittorio Emanuelle II. Many tourists consider this restaurant to be compulsory during their stay in Milan. We dined in the beautiful Toscanini Room upstairs. The service was great. We were served a four-course dinner again. The place is famous for serving traditional Milanese dishes such as the saffron risotto with ossobuco (bone marrow). The first course was braised veal cheek on Jerusalem artichoke cream and cocoa. The second course was pasta in a green sauce, with sausage and chestnuts. It was so yummy. The main course was Veal Ossobuco (bone marrow) with mashed potatoes. The meat was tasty, but the portion was rather large. The last course was Savini Tiramisu. It was definitely the best dessert I had during my stay in Italy. After the tiramisu, we also had a variety of some small cakes. The service was attentive, the dishes were tasty and the wines were also great! Take the train from Milano Cadorna station to Como town. The train runs very frequently (every 15-20 minutes). The train ride will take about an hour to the most spectacular lake, I have seen in Northern-Italy. 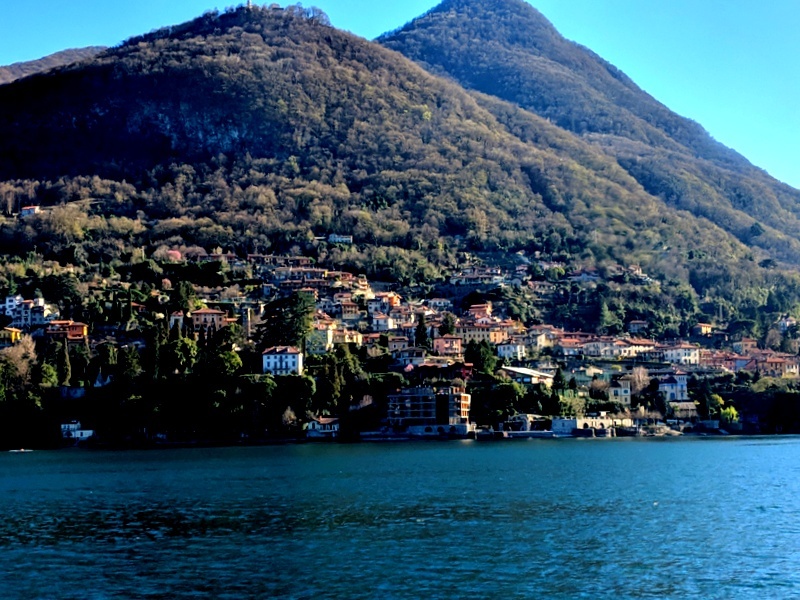 Como town is by far the largest town around the lake and it is definitely worth a stroll. You can visit the center in about half an hour. 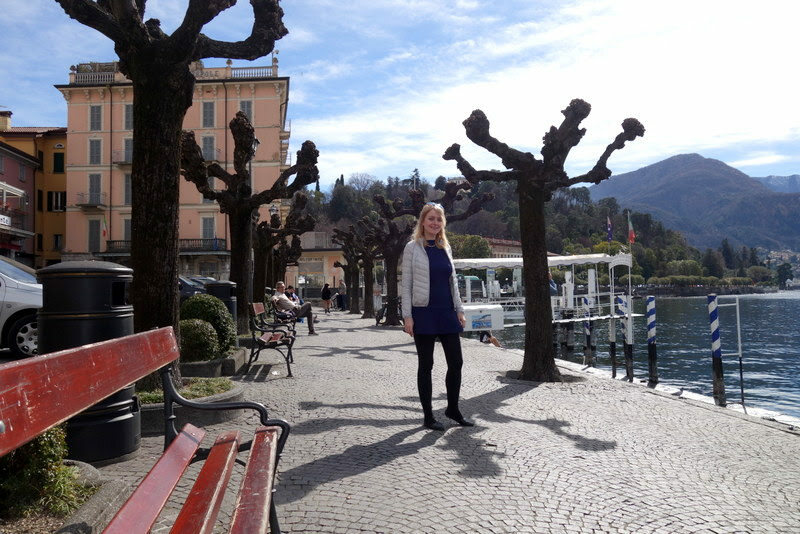 After seeing the main sites of the city, you can hop on a boat that travels between Como and Bellagio to see a different town around the lake. The ticket was €15 and the view from the boat was spectacular. This was the absolute highlight of our trip to Northern-Italy. Bellagio is famous for being the poshest town around the lake, with some of the most beautiful sites and best restaurants. Sit by the lake and have a delicious lunch. It will be slightly overpriced, but we only live once! Enjoy the sun and the views. Four Points Sheraton in Milano is a convenient place to stay. It is well located near Centrale station, so it is nearby all transportation options. The hotel is very nice and clean. The breakfast has all the options you can imagine. They serve many different kinds of delicious cakes and many types of croissants. The service is friendly. The rooms are not very large, but they have the biggest beds you can imagine. If you are looking for a comfortable, clean hotel, near the center, this is a great option! Disclosure: I participated in the trip free of charge for the purpose of this article. The article reflects my unbiased opinion about the country and I won’t recommend anything to my readers that I did not like. Tagged best places in Italy, visit Milan for a weekend.